Acupuncture is the insertion of thin needles at strategic points to promote wellness. It can potentially relieve pain, reduce nausea, or cure insomnia. The practice of acupuncture originated in China and has endured for centuries. It’s unknown why or how acupuncture works, but researchers are beginning to gain new insight into this ancient healing technique. Acupuncture has a long history. Documents from the Ma-Wang-Dui tomb in China refer to a system of meridians, or channels in the body through which the life force, or Qi (pronounced Chi), flows. The system in these documents was very different from the one later accepted and utilized by acupuncturists. However, it’s still thought that these documents might refer to some of the early studies that led to the development of the technique. The Ma-Wang-Dui tomb was sealed in 198 BCE, making the documents more than 2,200 years old. The first document to describe a system undoubtedly recognizable as acupuncture was The Yellow Emperor’s Classic of Internal Medicine, which is thought to have been written by Huang Ti and his Minister, Ch’i Pia (or Chhi-Po). This text dates from about 100 BCE. The concepts that surround the body’s meridians – specifically that the life force, or Qi, flows through the body’s meridians – was well established by this time. Over the next several centuries, acupuncture was fully studied and developed, and it became a standard part of Chinese medicine. In the fifteenth century, bronze statues were made showing the acupuncture points that are still in use today. Early acupuncture was performed using needles made of bone or stone. The Great Compendium of Acupuncture and Moxibustion was published during the Ming Dynasty (which lasted from 1368 to 1644), and this compendium still forms the basis of the modern technique. During the seventeenth century, the Chinese began to regard acupuncture as superstitious, and its popularity waned. In 1822, the Emperor decreed that it should be excluded from the Imperial Medical Institute. Acupuncture was outlawed in 1929 as Western medicine was increasingly accepted. It wasn’t until 1949 and the installation of the Communist government that it and other traditional forms of Chinese medicine were reinstated. Research institutes were established throughout China in the 1950s and the practice of acupuncture became widely available in China again. There had been short bouts of interest in acupuncture from other countries, including Europe and Britain. However, acupuncture didn’t spread to the United States until 1971, after a U.S. press corps member had an emergency appendectomy in China and was given acupuncture during recovery. He told the story to the New York Times, after which teams of doctors from the U.S. toured China to study the technique. As acupuncture gained popularity again, scientists began to examine why it works. It’s not yet clear exactly why acupuncture is an effective treatment, but there are several theories. During its new rise to popularity in the 1950s, in fact, Professor Han in Beijing, China, was looking at acupuncture’s ability to cause the release of neurotransmitters to relieve pain. This is similar to a modern theory: that the inserted needles stimulate nerve fibers, which activate the central nervous system. The brain and spinal cord respond by releasing pain-relieving endorphins. Another theory is that acupuncture increases blood circulation and body temperature, which affects the activity of white blood cells, thereby boosting the immune system. The increased circulation and body temperature may also reduce cholesterol and regulate blood sugar. However it works, the research shows that acupuncture does work for many conditions. Some studies looking at brain images even confirm that it can increase an individuals’ pain threshold, perhaps explaining its ability to provide long-term pain relief. Acupuncture can provide relief from a huge array of conditions. The location of needle insertion is dependent on what’s being treated. For example, the acupuncture point for hypertension is in the neck, while the points for constipation are on the belly and leg. Chronic pain relief, especially, has been well-documented as a potential effect of acupuncture. However, acupuncture might not relieve or cure medical conditions entirely, so it’s important to continue taking prescribed medications. Since acupuncture has a very low risk of negative side effects, though, it can be used to complement the treatment of many different conditions. To find relief from a pain condition with acupuncture, discuss it with your physician and find a reputable acupuncturist. Even if acupuncture has a low risk of negative side effects, it’s still something worth discussing with a physician. At the least, a physician might have suggestions for reputable, local acupuncturists. Additionally, several online resources, such as the National Certification Commission for Acupuncture and Oriental Medicine (NCCAOM), can help locate good acupuncturists. 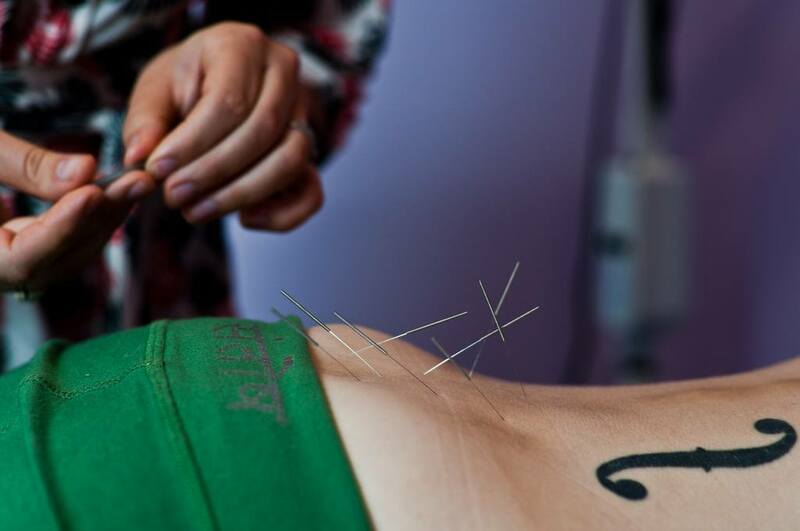 Historically, acupuncture needles were made out of materials like stone or bone. Some were even made out of gold or silver. Today, however, most acupuncture needles are thin filament needles of stainless steel. A good practitioner should use disposable needles. The needles should be new out of the package for each treatment. Additionally, anyone undergoing acupuncture treatment should discuss restricted activities with the acupuncturist. For example, it might be a good idea to refrain from intense physical activity or alcohol intake for a few hours after getting acupuncture. Have you ever benefited from an acupuncture treatment?